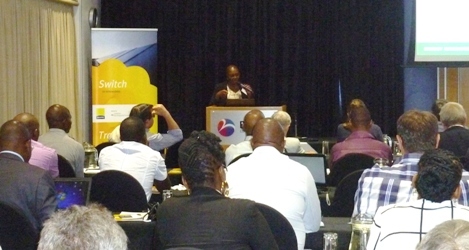 The Southern African Solar Thermal Training and Demonstration Initiative (SOLTRAIN) presented the project’s remarkable progress since 2009 during a conference in Midrand, South Africa, on 11 February 2016. 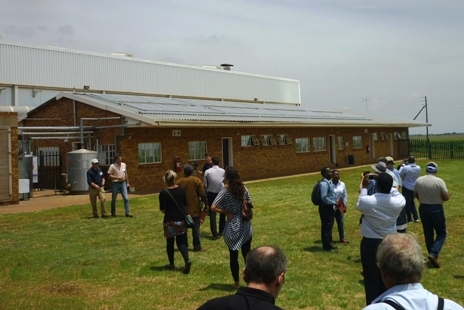 “Between 2009 and 2015, about 2,150 people have been trained in 80 courses, and nearly 187 solar thermal systems ranging from 2 to 250 m² collector area per system have been installed in the five target countries South Africa, Namibia, Lesotho, Mozambique and Zimbabwe,” Project Coordinator Werner Weiss, Managing Director of Austrian institute AEE INTEC, summed up the results. The photo shows the presentation of Dr Thembakazi Mali, Senior Manager Clean Energy Solutions at the South African National Energy Development Institute (SANEDI) on 11 February. The one-day conference was attended by 63 stakeholders from the SADC region. The event took place one day after a technical tour organised by Dieter Holm, SOLTRAIN Project Coordinator in South Africa and independent consultant, to the Gauteng Solar Thermal Flagship District and was followed by the kick-off meeting for Phase III of SOLTRAIN. The project was funded by the Austrian Development Agency and co-financed by the OFID, the OPEC Fund for International Development. Technical tour: Visit of the flat plate collector drainback solution at the Chalmar Beef production unit in Bapsfontein, South Africa, where two 60 m² systems produce hot water for cleaning processes. One of SOLTRAIN’s key targets was the “demonstration that solar thermal technology works,” as Weiss underlined in his presentation. Several demonstration plants were installed as part of training courses, others by commercial companies. Selected systems have been described in the attached SOLTRAIN Demo Systems Book, which was presented at the conference in its final version (see the attached document). Both smaller and larger plants were set up at social institutions and small and medium enterprises, where they have since contributed to water heating, cooling and the generation of process heat. The table below emphasises the electricity saving potential of solar thermal systems, as the SADC region has been suffering from electricity shortages and power cuts. For example, a South African household with access to the power grid uses 60 % of its electricity consumption for hot water preparation. Energy saved by the demonstration plants installed during SOLTRAIN phase I and II. The solar yield has been simulated with the T*Sol program based on specific system designs and local irradiation. The total annual electricity saving is calculated at 90 % efficiency of an electric element.